This menu looks like elegance meets good eats; a perfect match for a Saturday evening. And don’t forget to start drying your herbs, too! * Onward and upward - follow the flora. With autumn sneaking up on us, there’s still plenty of color to dazzle the eye. Combine the seasonal crops ready for harvest with the ‘what’s in’ flora and you’ve got yourself one heck of a fancy table arrangement. It should add a nice splash for that elegant dinner party. * And of course, tidy up the tinsel. Just checking to see how many of you notice the Christmas paper, holiday cards, lights, decorations – it’s already taking front row/center stage in the stores. You guessed it - right next to the lawn and garden supplies. Yikes. So tidy up your garden tinsel – those beat up tools in the garden shed sure could use a cleaning, especially if you plan on jumping ahead into the way-too soon tinsel-time of the year. *Just one last garden thought for Thursday - our quote for the day because we can never leave a blog post without one. 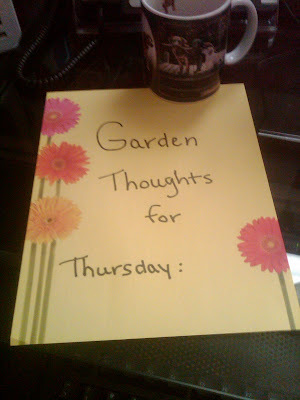 Carl Jung’s words seem most appropriate for this list of garden thoughts. “Often the hands will solve a mystery that the intellect has struggled with in vain.” So if you’re stuck in the midst of your own garden weeds, it’s always best to dig in, hands first. There will be plenty of time this winter for the intellectual gardener.